The description should be: "...this is a Plan 3950N 3 Compartment - 2 Drawing Room - lounge observation rebuilt from a 2 DR - 1 Comp - lounge observation..."
This is a Plan 3950 3 Compartment - 2 Drawing Room - lounge observation... of which none went to Burlington. Milwaukee Road use to serve Prairie du Chien, where the car is, and they bought five of these cars at the Pullman divestiture. While some further research will be needed I think I can confidently say that this is one of the five cars MILW bought in the Silver-series. I recall this car. I first saw it around 1979 and 80 sitting on a siding at a lumber yard on the Richland Center spur of the old Milwaukee Road. I think at the time it was a shortline running blue high-hood FM switchers for road power. It was a Milwaukee MOW car, and I remember it seemed to have orange paint underneath several other paint styles. It was probably restorable then, and had the platform railings. 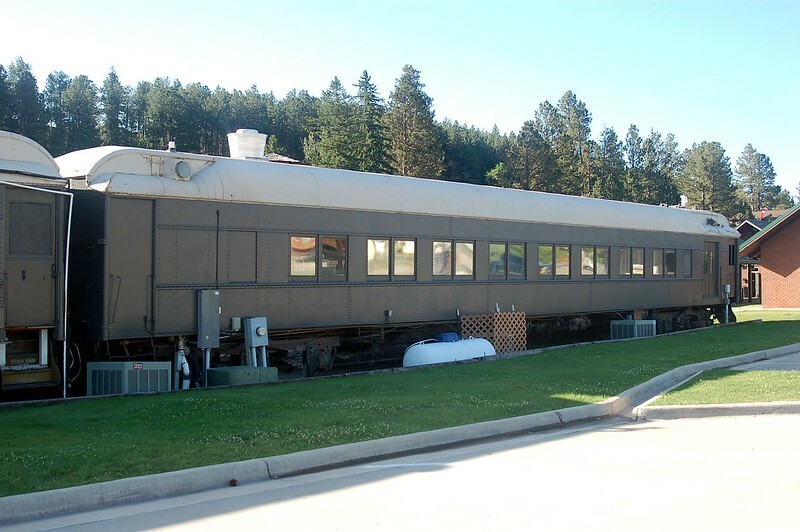 The Richland Center branch had extremely light rail and might have even been original from being regauged from narrow gauge. I later saw the car at Praire du Chein around 1991 and assumed it was the same car. I thought the line to PdC was embargoed from Lone Rock westward. Running down that track in this car must have been an interesting experience. Thanks, Jerry and Olin, for the info! Silver Beach to MofW #X-801. Silver City to MofW #X-740. There is a de-trucked, steel-sheathed wooden sleeper obs (ex "Constellation" or "Constitution")used as a summer home overlooking the Des Plaines River southwest of Chicago. It has the best wood-paneled interior of any car I've seen and all of the original fittings- including the canvas that pulls across the berths to keep cinders off the linen. Does anybody have more info on this car? Pullman or other builder? Thanks in advance! Wood private (business) car built in January 1906 in Lot #3262 to Plan #2110. There is no listing for a car named Constellation. Checking Volume Two, it lists that the Constitution was 1 of 3 such private cars built in that Lot: Constitution, Commonwealth, and Republic. These cars had 4 bedrooms: rooms A and D had full beds, B had a longitudinal "Davenport Lounge" sofa with upper berth, and C had the traditional facing section seats. Interestingly, there was a sofa in the dining room (with 8 seat table), and the sofa in the observation lounge had an upper berth (using the sofa's back). The Constitution is listed as leased to the government during WWI (along with the Republic), and was sold in June 1937 to L.J. Drake. Does anyone have more info on this car's subsequent ownership history, or if it is still located along the Des Plaines River as reported back in 2003? Thanks in advance! Briggs lists that WP #103 was rebuilt from a Pullman sleeper named Glen Eyre, but not a 6-3 car built in 1925. Rather, the #103 was rebuilt from the Glen Eyre (1st), which was built in 1898 to Plan #1379B. Briggs does not list the Lot #, the configuration, what the history of the car was before it was rebuilt to a business car, or when this rebuild took place. Does anyone have more info on this car, either as owned by Pullman or WP? Thanks in advance! Built in March 1899 in Lot #2382 to Plan #1379B as a private (business) car with the name Glen Eyre. It was specifically built for use by George Westinghouse, and after his death in 1914, it was sold in July 1916 to the WP as #01, and was renumbered in July 1927 to #103. The Orrville RR Heritage Society of Orrville, OH, is apparently in the process of moving locations, the new location being that of Dabo, Incorporated. There are several cars already at the Dabo site, which are not listed on the ORHS website, and I don't know for certain if these cars are owned by ORHS itself, ORHS members, or other private parties. Specifically, the information listed 3 heavyweight Pullmans, identities unknown...It should be noted that it apparently has come up elsewhere (where exactly I don't know) that at least some, if not most, of the cars which are already in storage at Dabo might be scrapped if new owners for these cars are not found. I just recently made a trip up to Orrville to take a closer look at these two Pullmans since they are due to be scrapped soon unless a new owner is found. I discovered something interesting on one of the cars and wanted to share my findings with the group. As I was inspecting PRR 492908, I found some of the original wooden window frames still in place on the car. When I checked them I found "Paul Revere" stamped on the side. So that got me thinking. PRR had two 12-section, 1-drawing room heavyweight sleeping cars named Trenton. Trenton (1st) is the one listed above as being PRR 492908, built in 1923 to Lot 4699, Plan 2410H, and off the roster by 1950. Trenton (2nd) was built in 1925 to Lot 4894, Plan 3410A and was originally named Paul Revere but was renamed Trenton in 1951. So is PRR 492908 actually Trenton (2nd)? If so then that means the two cars in Orrville were built together, served on the Broadway Limited together, put into MOW service at the same time, ended up together post career, and are still together 92 years later. 297. Armory Hill (Lot #6035, Plan #3961L, 1927, buf-plr-lng-obs [16 seats], GN, ex-Dolly Madison)--sold to GN (1945) to MofW to Reserve Mining Co. Parlor Car--does anybody know the current status/location of this car? i read a while back that the Glengyle of 1915 is the oldest Pullman heavyweight left. The sleeper is on display at the Museum of the American Railroad, Fresno, Texas. Is this date still correct? PS Sorry, but I did not read all 34 pages again. 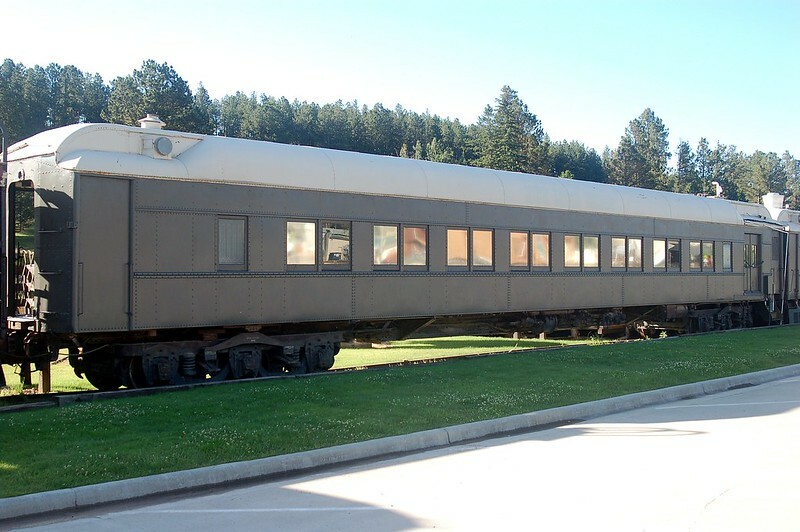 No, there are several all-steel heavyweight Pullman cars older than the Glengyle, both still in their original configurations (sleepers, parlors, and business cars), or rebuilt to other car types (coaches and baggage cars). 14 cars that are positively accounted for, and up to 3 additional cars that I don't have recent status info for. Glengyle is an early car dating from 1910. Information from Tom Madden's Pullman Project website. I think the claim of the car being the oldest surviving Pullman was once made by its preserver, the Age of Steam museum at Dallas, Texas. This is now the Museum of the American Railroad in Frisco, Texas. The current website does not make that claim. These 7-2 cars were used on high-end train service that demanded all-room cars. If I recall correctly, the car was modified at some time (maybe the 1937 date) and alternate connecting doors were closed and a small closet was installed in each room at these locations. Apologies for bumping this thread, but I've seemed to have run across some other cars not mentioned previously. All of the cars are unknown, and what I do know is to the best of my knowledge, so any further light that can be shed upon them would be greatly appreciated. -A Solarium Observation at a real-estate firm in Woody Creek, CO (near Aspen), it appears to be of a similar plan to the Mt. Series cars (that of 10 Section-Solarium Obs.) but I cannot confirm that. -Another car at a restaurant in Houston, TX. It is currently painted as C&NW 300915, which is a MoW number, however I was unable to find info regarding C&NW MoW cars and former histories behind them. -A car on the Stone Mountain Scenic, the image is not the best, but from what I can see, it has had either one or both ends modified to an open platform. -Two cars in use as a snack shop on the Black Hills Central in Hill City, SD. They are both former Parlor-Drawing Room cars that were sold to the US Army and converted to Hospital Cars. The numbers (as found from personal observations) are 552 and 553 respectively. Anyone happen to know the names of the cars? 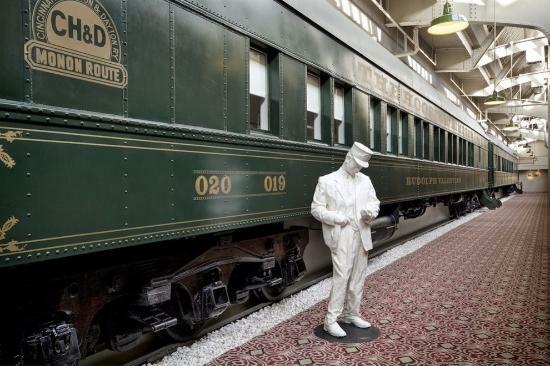 -Lastly, does anyone have any information on the number of cars used as a hotel at Indianapolis Union Station, by my estimated counts (gleaned from various photographs, an example of one of the cars is below), there are about 13 or so cars (might have duplicated one or two in my counts), 11 of which appear to be former Pullman sleepers and the other two appear to be former Pennsy coaches. Pullman Plan 2412B 16 Section sleeper INTREPID to TC 4150 (8/35) sold to C&NW 9/53, to X300915. From the book, THE COMPLETE ROSTER OF HEAVYWEIGHT PULLMAN CARS, Wayner Publications. This car has been on Stone Mountain Scenic for many years but I have had no luck in figuring out which car this is. Hopefully something yet can be determined about it. Ditto for the hospital ward cars on Black Hills Central... have known about them for a while now but nailing down identities of these two cars isn't something that is easy to do, what with records for cars rebuilt to hospital ward cars (most later to mortuary cars) being rather scarce. Here's hoping that some of these cars can be ID'ed. The Central of Georgia acquired two Plan 3521A 10 Section - lounge observation cars from Pullman, Monte Rosa and Mt. Ouray... I would bet that this car is one of them. Monte Rosa became Central of Georgia 32802 PROGRESS Instruction car, which now resides in Orlando, Fl. Mt. Ouray is listed as being acquired as well but withdrawn from Pullman lease not quite a year after it was acquired. It wasn't selected by CofG to become a business car (both the ATLANTA and SAVANNAH histories are known) so what happened to this car? It yet may be that this is the car that is at Stone Mountain. 001/002 - New York, Chicago & St. Louis "Charlie Chaplin"
003/004 - New York, Chicago & St. Louis/Pullman "Louis Armstrong"
005/006 - New York, Chicago & St. Louis "John Phillips Sousa"
007/008 - New York, Chicago & St. Louis/Pullman "Benjamin Harrison"
009/010 - New York, Chicago & St. Louis "Winston Churchill"
011/013 - Chicago, Indianapolis & Louisville "P.T. Barnum"
015/017 - Chicago, Indianapolis & Louisville "Diamond Jim Brady"
019/021 - The Hoosier Limited/CH&D "Rudolph Valentino"
023/025 - The Hoosier Limited/CH&D "Lillian Russell"
Are these all heavyweights??? Anyone know of pictures of these cars?? ?